Harriet Beecher Stowe was a woman who had a strong opposing view against slavery, and one of the main topics she focuses on is the woman’s role in the anti-slavery movement, as is apparent in her most famous novel, Uncle Tom’s Cabin. It is also apparent in her personal life, where it is mentioned that she and many other women are taking action towards the anti-slavery movement. Her idea of writing this novel did influence a great many people in the country, particularly with the presence of such strong female characters and her ability to write with the intention of sparking empathy in mothers throughout the nation. It is mentioned several times throughout Stowe’s personal letters addressed to a variety of people that Stowe is acquainted with women who are involved in the anti-slavery movement. One letter in particular, addressed to her husband, Calvin Ellis Stowe in July of 1837, mentions that “a lady who takes a leading part in the female society” had called up Stowe’s sister, Catherine, and brought “the proceedings of the Female Anti-Slavery Convention” (E. Bruce Kirkham Collection. Harriet Beecher Stowe Center. Hartford, CT). She believes that this particular party has made a great effort in attempting to move forward with the anti-slavery movement, but she also expresses how she feels trapped in Cincinnati because her mind is awakened to this subject, yet even if she were to spread the awareness there wouldn’t be anything that could be done. So while there were in fact women who were putting in their best effort to proceed with the abolitionist movement, Stowe still felt that if they were too radical, they would scare away even the people who were for the cause. It would be several years later that Stowe would write a novel that would change the era in which she lived and mark a significant turning point in the anti-slavery movement. Uncle Tom’s Cabin was first released weekly in a newspaper called The National Era, and Stowe did such a remarkable job that it was published into one volume, becoming the book that changed the way America viewed slavery, freedom, and equality. Her controversial views that slaves are just as human as anyone, with the capacity to feel and love, and that slavery is an immoral act, is the common theme of the novel and appears in various forms within different characters. Take for instance, Mrs. Shelby, a kind-hearted Christian woman who does not believe in slavery, and always treats the slaves her husband owns with the utmost respect and love as she would with anyone else. She raised Elisa as she would her own child, a character that would trigger much emotion in many mothers throughout America. Stowe’s personal loss of a child was reflected in her writing when Elisa discovered her son was to be sold to a slave trader, and the way that she fought to escape and help herself and her son was inspiring and gave much insight to the reality of the pain that slave mothers felt when being separated from their children. By writing about this from the slave’s perspective, she was able to show her audience firsthand that slaves were people and had human emotion, a concept which some slave owners seemed to have a difficult time grasping. Her novel gave people the ability to see slavery from many different perspectives, including the point of views of the slaves, which had a major effect on the general public at the time. Stowe’s ability to produce a book that caused such an uproar in the nation was key to bringing awareness and progress to the anti-slavery movement. Perhaps it was after this that Stowe would consider herself an abolitionist, for Uncle Tom’s Cabin had such a huge and controversial effect that it seemed to exceed the simpler and less radical anti-slavery actions. With the help of propaganda, the novel was a huge success in changing people’s views. Legend has it that Abraham Lincoln himself said to Stowe “So you’re the little woman who wrote the book that started this great war,” due to the fact that the popularity of the novel eventually led to the Civil War. The fact that women at the time did not have as many rights as men did, yet Stowe wrote this revolutionary novel that included many strong female characters, both white and slaves, is remarkable. Her association with many women who were involved in the anti-slavery movement, as is seen in her personal writing, had an influence on her female characters, another one including Ophelia. While Ophelia did oppose slavery, she had a prejudice against blacks, a view that later changes in the novel. I can imagine that many people reading the novel should have also had such a change of heart. Stowe’s friendship and involvement with other members of the abolitionist party, and her interactions with slaves, was key to her ability to write such a successful and realistic novel like Uncle Tom’s Cabin. Another letter in which Stowe mentions that she is associated with yet another woman who is involved in the anti-slavery movement is one that is addressed to Cassius Clay on November 9, 1853, where she poses the question, if anything like an approximation towards emancipation should be expected from Lucretia Mott’s hearing at Mayville (E. Bruce Kirkham Collection, Harriet Beecher Stowe Center, Hartford, CT). This same woman was also very involved in the women’s rights movement. It can be thought that Stowe’s connection to these people who shared a similar vision as her might have also had an influence on the amount of progress that was made throughout her lifetime. Uncle Tom’s Cabin marked the era she lived in, and it was because she was so involved with different individuals who were also fighting for change that she was able to make such a difference in the nation. Harriet Beecher Stowe was able to accomplish everything she did by her connection to people, specifically women, who were involved in the anti-slavery movement, her determination to push forward for the rights of slaves, and her ability to create a successful novel like Uncle Tom’s Cabin. It was after the publication of the novel that her vision and actions really took shape, and as a woman, she was able to write in such a manner that empathy was unavoidable when reading her work. Her personal letters show that she was acquainted with many strong, influential women, which was reflected in her novel by having strong, determined female characters. 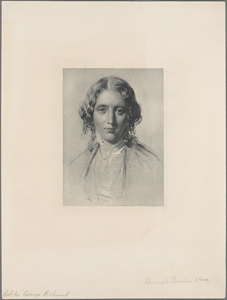 E. Bruce Kirkham Collection, Harriet Beecher Stowe Center, Hartford, CT.
Stowe, Harriet Beecher. Uncle Tom’s Cabin. Auckland: Whitcombe & Tombs, 1930. Print. Submitted for ENG 220, Studies in American Literature, Fall 2015. Instructor comments: This class met entirely at the Harriet Beecher Stowe Center and the Mark Twain House & Museum and gave students full access to the archives and, significantly, to the transcripts of all of Harriet Beecher Stowe’s surviving out-going letters. In her research of the E. Bruce Kirkham Collection, Amily found some letters that gave her insight into Harriet Beecher Stowe’s growth from a by-stander in the anti-slavery cause to a major voice in the movement. In her essay, Amily deftly moves between evidence in the letters to evidence in the novels in order to make her case that Stowe advanced social justice in her time through a distinctly female perspective. Nice insightful essay by amily Colin about Stowe and her influential writings.